Thanks Paul and Sandra .. Wanted down in Kent, too, TT, please! I've done most of it but am fast running out of steam (and black plastic bags!). Lovely photo of a very clever Conker. That is so funny! I am obviously not training Tyler properly :o) Love It. I guess he spreads them around for you.....just to keep Conker entertained! ... and then, next stop ... Angus ..
Ha`ha nice pic terra,maybe when he`s got the leaves up he could clean your windows instead of me,great pic. Aren't I a good boy Mum...!! Has he got his own passport? If so, put me on the long list of needing his help. You may need to give him some extra TLC when he gets back though - the village dogs are tower blocks for all sorts of nasties living in their fur! Hello Kev ... it seems you're not very keen to clean all my windows... maybe word has reached you how Truffle puts muddy paws all over the kitchen door... ha ha .. Does Conker ever visit Norfolk if so could he drop by and lend a paw? Hi Sheilamj .. Thanks ..
...and I blew a kiss to Crocus budgie ..
Maybe Tiny could flap his wings like a leaf-blower....Lol. 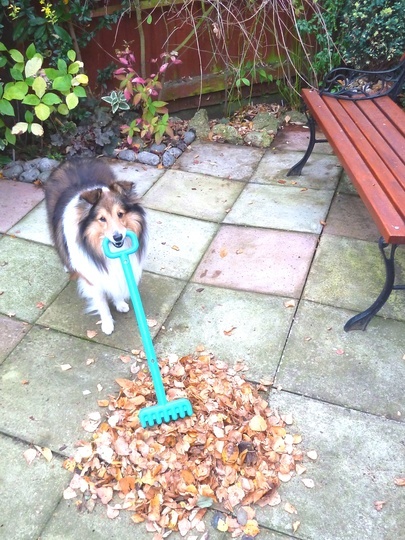 Conker is such a help in the garden .. I think you should send him round to me, I have loads of leaves!Doesn't he take a lovely picture. Glad Conker got a reward for helping out Terra. He's loving the stardom. doesn't expect treats... they are just a bonus..Lol. Great TT, we could certainly do with his help a few places. Plenty of work for him and he's cheap too if he doesn't expect payment. LOL. Hi Bob ... Thanks ..
Conker can certainly include Surrey in his route ... LOL. Miss Piggy sends an SOS to Conker...she can't eat the leaves fast enough and is in danger of getting buried in them and I will never find her again 'till spring. Great picture! Conker seems such a clever doggy. I wish i could train my budgies to chase the squirrels from my garden. He has lots of gardening tools.. Lol. Great pic , so cute . ... Conker is sometimes almost too cute...Lol.